As the Dallas Cowboys made the difficult decision to release Dez Bryant, it ushered in the beginning of the overhaul of the wide receiver group. Much like they did in 2017 when they allowed Morris Claiborne, Brandon Carr, JJ Wilcox, and Barry Church to walk in free agency, and then proceeded to draft four defensive backs in the 2017 NFL Draft, the Dallas Cowboys began the painstaking task of overhauling a position group that has seen very little change in the last five years. Dez Bryant, Terrance Williams, and Cole Beasley have all been mainstays on the depth chart and had solidified roles with the team as the top three targets during the Tony Romo and now Dak Prescott eras. What took place in the 2018 NFL Draft, however, was evidence that the team isn’t content with the status quo. The first big move over draft weekend came on Friday, when the Dallas Cowboys were rumored to be targeting SMU Wide Receiver Courtland Sutton. Instead, they held their picks and selected Colorado State Wideout Michael Gallup with the 81st pick. Many see Gallup as someone who will be a lead receiver, if not week one, then by the end of the season. Then on Saturday, after team favorite Nyheim Hines went off the board, the Dallas Cowboys made a trade with the Los Angeles Rams for wide receiver Tavon Austin. In a draft that provided very little drama for the Cowboys, this was a shock. There had been little indication they were interested in making a move for the dynamic wide receiver and kick returner, but they pulled the trigger adding a dynamic threat to a team that needed more explosiveness on the offensive side of the ball. While many of us, this analyst included, were dreaming up the possibilities of what Tavon Austin could look like on the field with this current receiving core, the Dallas Cowboys got a call from the Oakland Raiders about one of their wide receivers. Another surprise took place. After only one season with the team, the Dallas Cowboys traded second year wide receiver, Ryan Switzer to the Oakland Raiders for defensive tackle Jihad Ward. Many thought Switzer could replace Beasley’s role in 2019, when the 2016 receiving leader's contract expired. Switzer didn’t get a lot of opportunities on offense in his one year with the team and mostly because of the log jam at the top of the depth chart. Where Switzer’s impact was felt, however, was as a kick returner. It’s important to note that Dallas had Jihad Ward only ranked five spots below current Dallas Cowboys defensive tackle, Maliek Collins in 2016. The Oakland Raiders made Ward their second round pick in 2016. In 2013, the Dallas Cowboys had a first round grade on Tavon Austin. The Dallas Cowboys came away with two players they really like for a fifth round pick and a player that wasn’t getting much run in Dallas. It could be argued that Switzer or another wide receiver was expendable with the addition of Tavon Austin. Austin is faster, more explosive, and has more experience playing the gadget role the team was hoping Ryan Switzer could play. For the Los Angeles Rams, Austin took snaps lined up as a wide receiver and took snaps in the backfield. He was also the primary returner for the Rams. Austin immediately slots in as the team's kick and punt returner, jet-sweep guy, and deep threat, potentially making Deonte Thompson expendable. While the Switzer move was a bit surprising, the Dallas Cowboys weren’t finished addressing the WR depth chart in the draft. They selected Boise State wide receiver Cedric Wilson in the sixth round. Like Gallup, Wilson is a polished route runner who was very productive over his last couple of years at Boise State. Who knows who will stick around after the 2018 season, but it’s obvious that the Cowboys want more consistent production from the wide receiver group and are trying to find guys who can get open quickly for quarterback Dak Prescott. 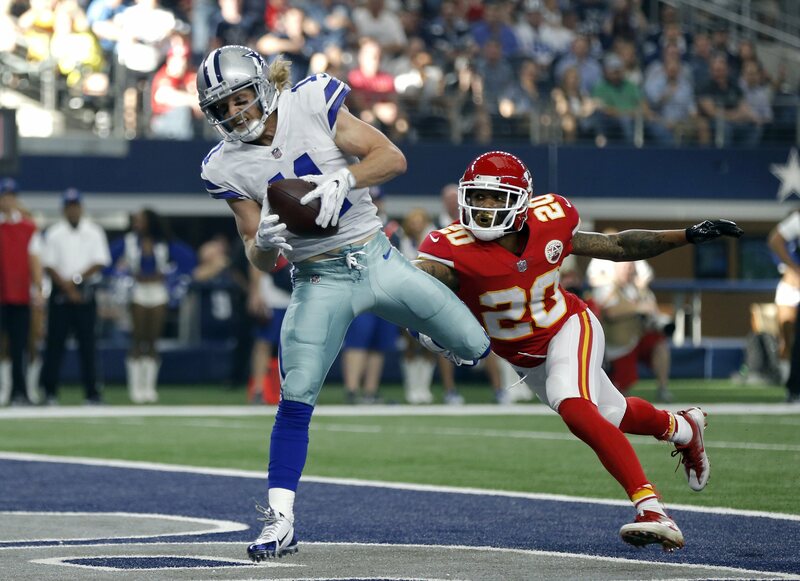 With Cole Beasley on a contract set to expire and approaching 30 years old next offseason, the team is expected to move on after the 2018 season. Terrance Williams, though his contract would not allow for any team friendly management in 2018, gets a bit friendlier to the cap in 2019. There are eight receivers on the roster who have a legitimate shot at being on the 53-man roster come week one. If you include a guy like Lance Lenoir who has made noise over the last two training camps, the wide receiver competition gets even more cloudy. Cole Beasley, Terrance Williams, Allen Hurns, Tavon Austin, Michael Gallup, Noah Brown, Deonte Thompson, and Cedric Wilson all have a legitimate shot at making the roster. They may designate Austin as a RB and he could be listed on that depth chart, but what we know is they aren't going to take seven or eight players on the 53-man depth chart. Training camp will provide more clarity as to the roles each could play in 2018 but one thing is clear, a shakeup is happening and more surprises could be on the horizon. What Holes do the Dallas Cowboys Need to Fill? Are the Dallas Cowboys Done Pursuing FS Earl Thomas?